A couple of weeks back a good friend of mine showed up on my door step with a whole lot of food she had left over from a TV shoot they had been filming up here. I was chuffed to find I’d scored several packets of Calasparra paella rice (the one in the lovely creme and red cloth sack) high quality saffron, black salt and a couple of kilos of chicken oysters ( the tasty little morsels on the back of the chook and don’t worry these had been in the freezer!). 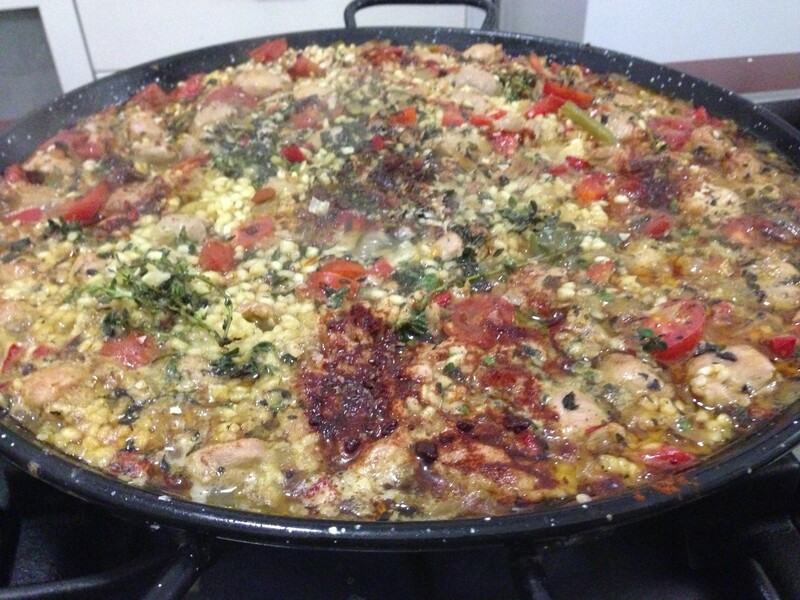 Consequently I have spent to past few weeks telling myself I must make paella, so last weekend I did exactly that. Make sure you gather a crowd, approx 8 mouths should do be able to polish it off without too much difficulty. Here’s the recipe, but please use only the best ingredients, if you want to make a crowd pleasing paella. The rice is really important, you can usually buy Calasparra at a good deli. To start off you will need to make a soffrito – a combo of slow cooked onions and capsicum, this will be your flavour base, so please no rushing and no burning of the onions!! Heat the oil in a paella pan, i used one of the black and white enamel ones. Add the onion, capsicum, garlic and strips the leaves off 8 sprigs of thyme, cook the oil over a medium heat for 15 minutes or until the onions are soft and golden brown. Add the smoked paprika, tomatoes and saffron threads with the soaking water and cook until the tomatoes skins soften (if you want to you can peel the tomatoes but i don’t cause life is too short). Add the pork and chicken and cook until browned, dont rush this part. Check the pan to see if it has enough oil, you may need to add a bit more as you are looking to create a crunchy base for your paella, not a risotto, so you want to fry the rice then add the liquid and not stir it again. Ok so now add the rice into the hot oil, fry the rice and stir it to ensure the rice grains are coated with the oil, then add the stock. Leave it now for about 20-30 minutes or until the rice is tender, cooking time will vary depending on the size of your element, ideally cook it on a barbecue or an open fire, I cooked mine over the wok burner and just kept on turning it. You may also need to add some extra liquid if its starts to dry out before the rice is cooked. When the rice is cooked, cover the pan with foil and allow to stand for 5 minutes, this helps release the crunchy base from the bottom of the pan. Finish it off with some extra time leaves, a few pinches of smoked paprika, some black salt if you have any or sea salt if you don’t. 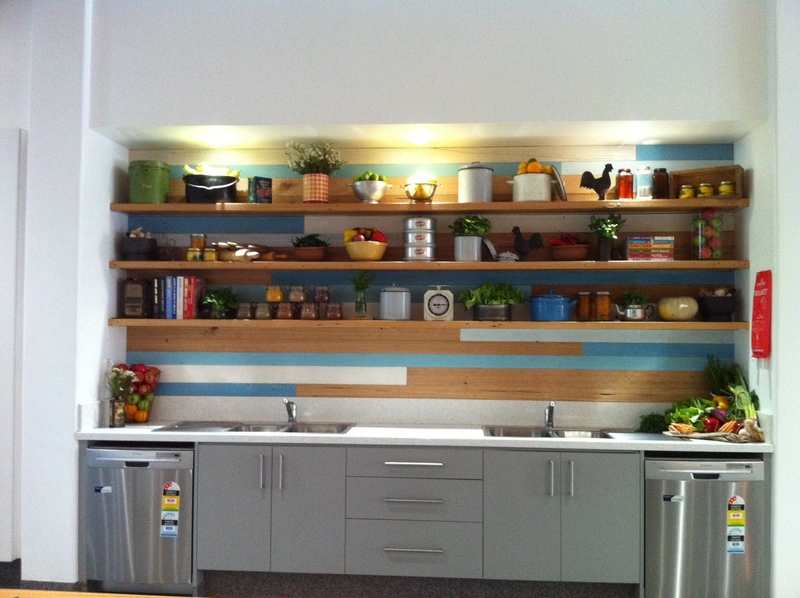 Squeeze a bit of lemon over and take it to the table. *Please note that the pic shown is the paella whilst it is still cooking, there should be no liquid visible once the rice is tender. As we are blown (literally) into spring it is time to cut back on the dairy, meat and eggs and give the liver a rest. I am about to start doing a liver detox with my yoga students and I have a few rules I like to stick to when it comes to changing the way we eat at this time of year. I believing in easing my way into a cleanse and easing my way out. A teacher once told me that the first food you eat after a cleanse is the food that your body will crave from then on, so be sure to choose wisely. If you are wondering if you need to detox, the answer is probably. Most of us these days are guilty of overeating and consuming way too many acid forming foods (meat, dairy, eats, alcohol, sugar). So feel free to join in the detox, say bye to sugar, yes that includes all the healthy ones (and yes that includes fruits, a few green apples in your veg juices is ok) and drop the grains and refrain from alcohol. Aim to drink lots of chamomile, liquorice, dandelion and peppermint teas. But do it away from your meal times, try to avoid eating 30 minutes before and after meals. Eat plenty of greens, this includes sprouts, brassicas and the leafy ones, especially kale. Through some spirulina or chorophyll into your vegetable juices and dress your salads with apple cider, rice wine or brown rice vinegar, alternatively use a good squeeze of lemon juice. Here is a great recipe to ease yourself into your cleanse, once you start the cleanse omit the brown rice and use the quinoa on its own. Quinoa is a grass not a grain and an excellent source of protein so it will leave you feeling satisfied. Have fun with your cleanse and if you can, get yourself to a yoga class which will assist the body in classing the liver through twisting postures. 1. Heat the oils in a wok, add the spring onions and stir fry for 3 minutes or until soft. I thought it about time I tried to make something a little healthier with my never ending supply of mulberries. Mash the mulberries together with the coconut sugar and half of the chia seeds, spoon into four small glasses. Whisk together the coconut milk, the remaining chia and maple syrup. Pour over the mulberry mix. Chill for 3 hours or until set, top with pumpkin seeds and some extra mulberries. If I had to say which cake is my favourite ever cake this one would win hands down. Based on a recipe out of the wonderful Rose Bakery cookbook – Breakfast Lunch Tea published by Phaidon books. Here is my gluten free version of this knock your sock of cake/dessert/can’t stop at one piece sweet treat. Preheat oven to 180C (350F) Grease and line a loaf tin. Cream butter and sugar until pale. Add zest and rose water and beat until combined. Add eggs gradually beating well after each addition. Fold in ground nuts and baking powder. Spoon mixture into the tin, Bake for 40 minutes or until a skewer comes out clean. Allow to cool in tin. Place vanilla bean, lemon juice, zest and and sugar into a pan and stir until the sugar dissolves, bring to boil and cook until reduced slightly. Pour syrup over cake, finish with the pistachios, pomegranate and mint leaves. Serve with creamy yoghurt. 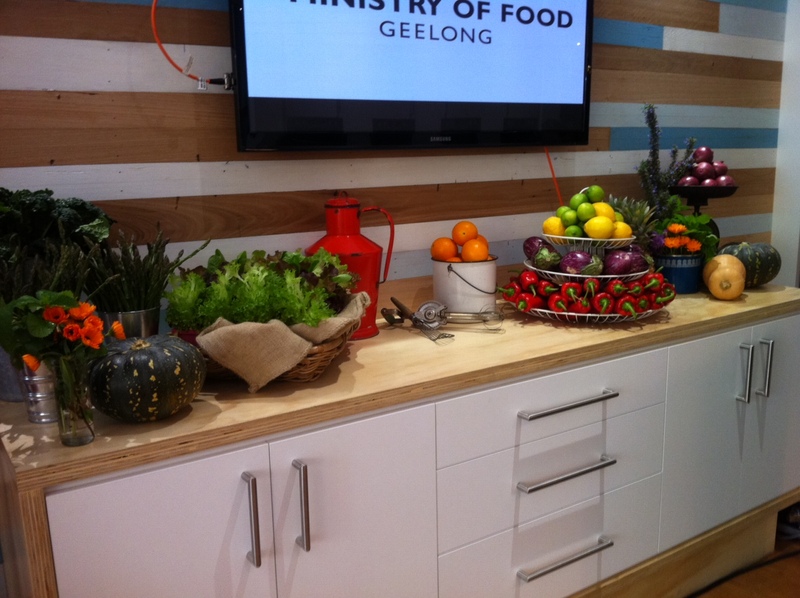 So happy to announce that the stunning city of Geelong is now home to the second Jamie’s Ministry of Food Centre in Australia. Encourage all of your friends to come along, enrol in a 10 week course. This is an amazing programme that transforms peoples lives and so many people need to change what they are eating. Obesity is a world wide problem and it can no longer be swept under the carpet. Thanks to the Victorian Government and The Good Guys for all their support in sharing Jamie’s passion for good food and good health. Ok, I think I have discovered my all time favourite dessert. Big call, I know. It has all of the elements I love in a sweetie. 1.Meringue- the soft gooey marshmallow type. 2.Passionfruit – the fruit that just makes my taste buds sings, it always feels like the sun is shining when i eat passionfruit. 3. Custard cream – not the runny warm over pudding type but the thick patisserie type that has been enriched with some marscapone. 5. 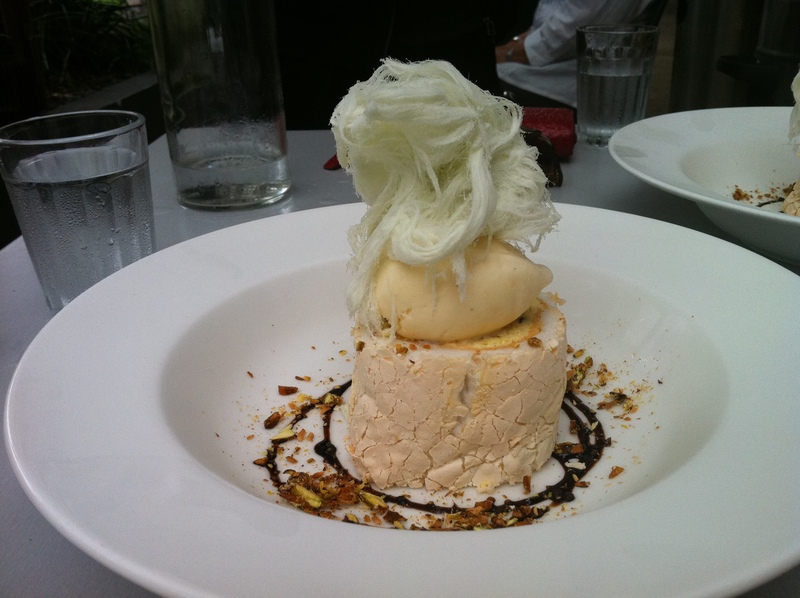 Persian fairy floss – this stuff just makes you feel like a kid at a super ritzy carnival. You will find this absolute treasure in a wonderful little restaurant called Pitchfork in Peregian Beach – about 15 minutes south of Noosa. Tip go the first day you arrive in Noosa – so you can experience this absolute beauty more than once. I am planning my next visit as I type this. On a recent trip to Melbourne I order flounder, it was bloody delicious. So I was absolutely stoked when I came across three of them (yes just three, not a huge tub full) at Mullumbimby Farmers Market the other day . I bought all three and must confess to eating all three. My intention was to share them, but they were they were just too damn good. And they are not very common fish in these parts so I happily polished them all off without feeling the least bit guilty. 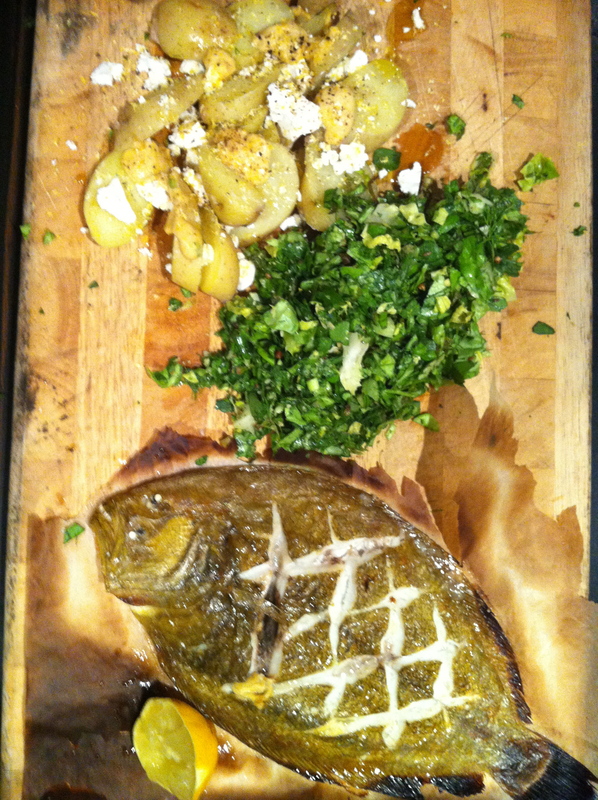 To be completely honest, I had never cooked flounder before so I kept it simple. I scaled them with a spoon,then scored the top of them with a knife, drizzled them with a little olive oil and generous sprinkle of sea salt and cracked pepper. I cooked them on a baking tray lined with baking paper under a hot grill and had the oven on at the same time on 250C. They took about 7-10 minutes and once they were done, I finished em off with a dob of organic butter and a squeeze of lemon (grown on my very own tree). I accompanied Flounder 1 with my new favourite chopped salad – think lettuce, tuna, avocado, dill, tomato, capsicum and parsley (I’ll rave about those in a later post) Flounder 2 I teamed with a chopped potato salad – think yoghurt, mustard, dill, capers, mint and lemon sorrel Flounder 3 with another fancy pants salad. I am now on a mission, fossicking for flounder, if you happen upon any be sure to let me know where you find em, or do yourself a favour and sample one. There is more to life than snapper, barra and flake.